Enjoy Hours of Fun & Get FREE Eggs Out of the Deal. 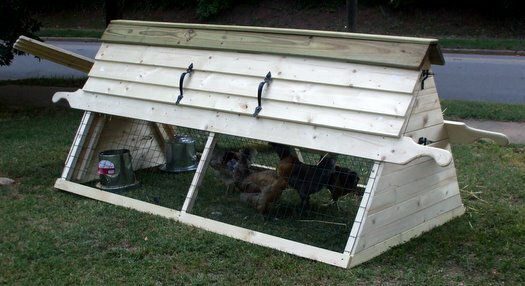 Raise Your Backyard Chickens in a Handbuilt Catawba ConvertiCoops Chicken Coop from My Simple & Now Improved $19.99 Plans. I intentionally left the door open on my Catawba ConvertiCoop the other day. I wanted to see what would happen. 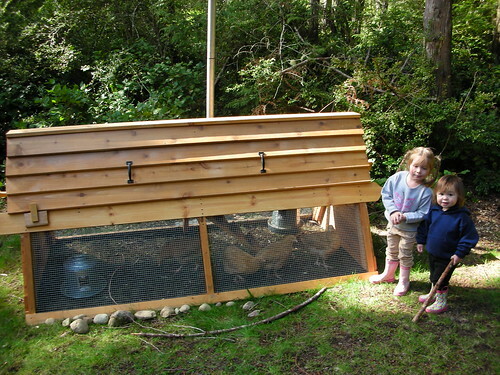 My three daughters came down from the rabbit cages into an area we call "the glade". It's a patch of grass surrounded by trees which usually stays well shaded during the summer months. That's where we keep the mobile chicken coop when the temperatures get above 90 degrees. "Daddy!" 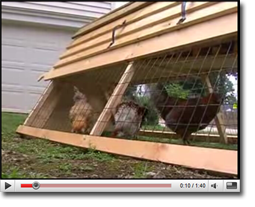 they chimed, "You let the chickens out. Can we chase them back into the coop?" I can't imagine anything more entertaining than watching your kids run around at full steam... birds running, feathers flying, trying to chase chickens back into a coop. They might as well be trying to herd cats. Eventually the kids did learn how to gently coerce the birds back into their Catawba ConvertiCoop. 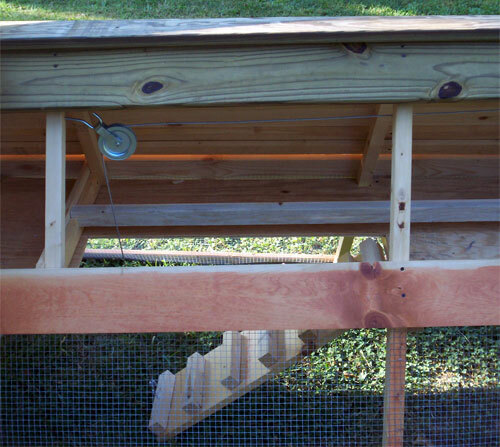 I could have told the kids a little later that evening the birds would have gone back into the chicken ark naturally to roost. But what fun would that have been? 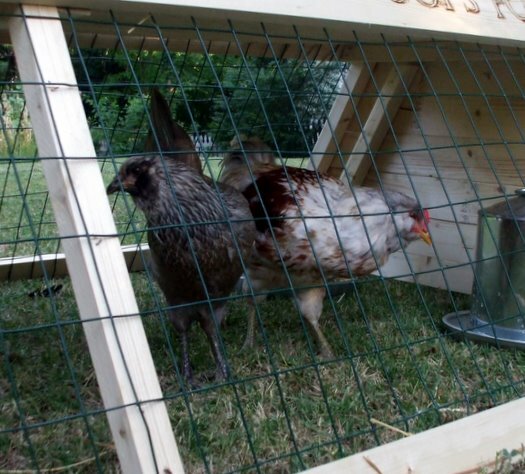 How can I keep chickens in the city? 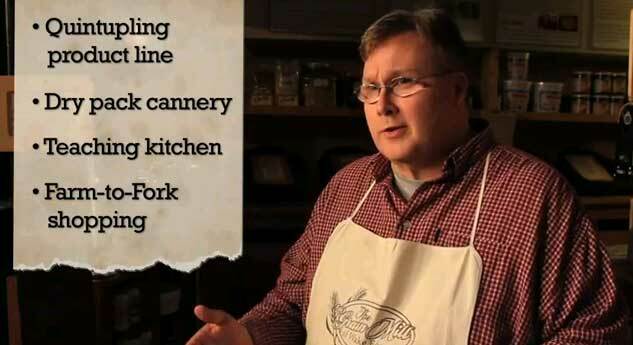 People think chickens are smelly, messy, and loud beasts. This could not be further from the truth. Because I live in a town with livestock ordinances, I had to find a way to convince my neighbors that chickens weren't such a bad thing. Just wanted to drop you a line after having completed the build. First let me say that I was reluctant to purchase your plans thinking I could figure it out from the numerous pictures and descriptions available on your site. However, I decided it would be less complicated to work from plans and let me tell you it was money well spent. The materials list alone saved what no doubt would have been many trips to my local Lowe's and all of the detailed measurements and cut lists probably saved me at least a day of figuring. 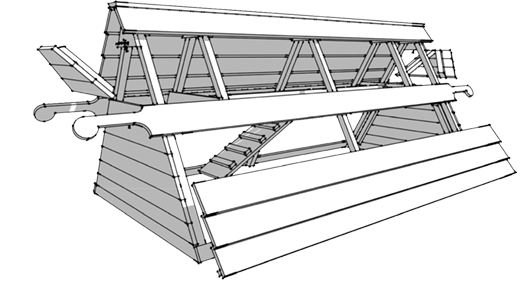 Building an ark from the Catawba ConvertiCoops DIY Chicken Coop Plans addresses two of the three major objections your neighbors will have against chickens. Because it is highly mobile, the smell and mess are a non-issue. 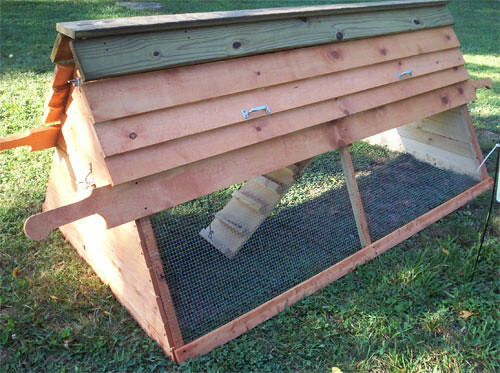 The chickens will not stay in one location long enough to foul the area. A firm "NO ROOSTERS" policy will eliminate the third objection. The chicken coop as art. 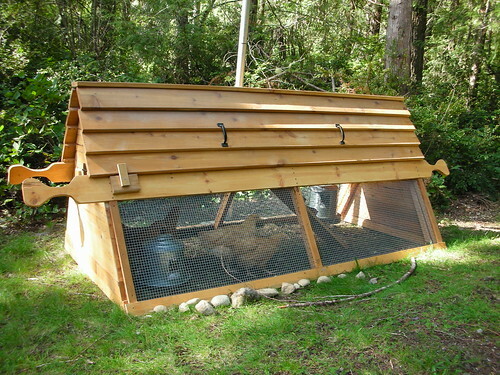 The Europeans have taken chickens arks as they call them, to an art form. 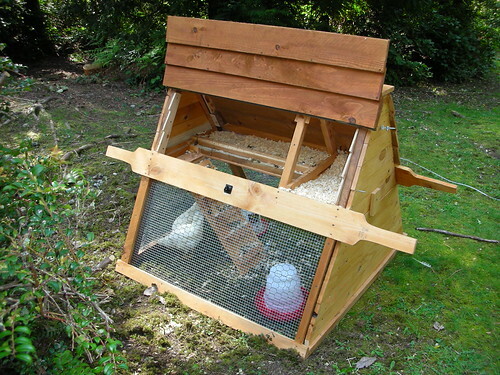 But with the US dollar weak against the Euro, who can afford to pay $1,000.00 or more for a place to keep their chickens? The Catawba ConvertiCoop can be built for significantly less money, and still maintain the look of a piece of fine cabinetry built with relatively few woodworking tools. 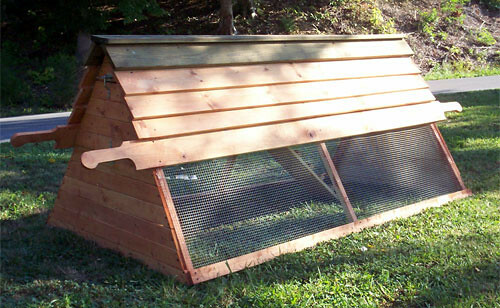 It's possible that you may have already seen one of those amazing European chicken arks and thought, "I wonder how I could build a portable chicken coop that looks that nice?" 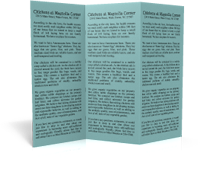 My improved $19.99 booklet will show you how. 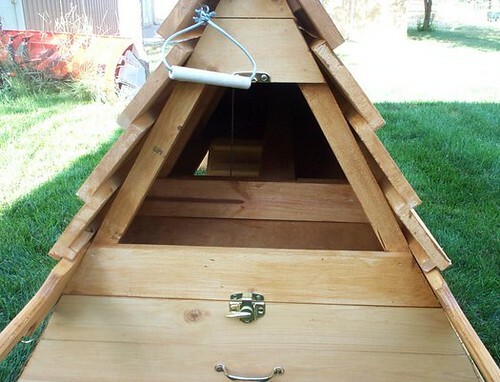 A plan so simple, even those inexperienced with woodworking projects can do it. Really... Take my wife for example. She home schools our three daughters, keeps a neat and tidy house, and ensures that everyone has clean clothes. She's a good cook and can follow a recipe to the letter. But she's no carpenter or cabinet maker. Neither am I for that matter. What she can do well is follow instructions. You don't have to own a "New Yankee Workshop" to build a Catawba ConvertiCoop that will stop pedestrians and passers-by in their tracks. I'm really bummed because I just sold another coop like the type I designed. The difference is; the Catawba ConvertiCoop takes me 3 half days to build. My design takes me 2 weeks or more of half days. 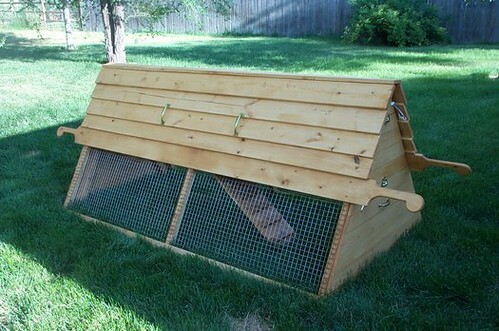 I sell my coop for $650 and can probably this one for the same amount, if not more. 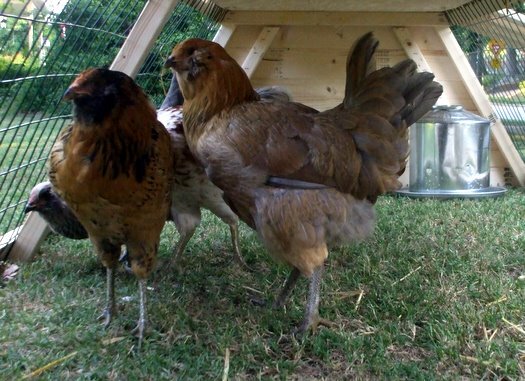 But in addition to building these coops, they have sent me feedback on the plans with additions they made, building steps they switched, and overall suggestions to people like yourself on how to make building this DIY chicken coop even easier. 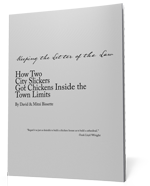 In December 2009, I collected all the emails and incorporated their excellent ideas into the book. 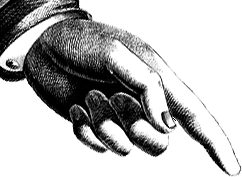 Along with new more detailed technical illustrations and hints on how to make your Catawba ConvertiCoop even better, the thickness of the book nearly doubled. However, the price remains the same! Step 2: Cut your wood using my easy to follow directions. I've done all the math for you! 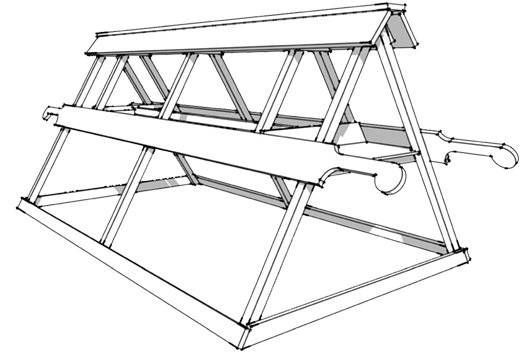 I've included a cutlist and an illustration showing how many pieces of your new Catawba ConvertiCoop you should be able to liberate from a piece of dimensional lumber. A miter saw, jigsaw, and electric drill are all the electric tools you need. Step 3: Assemble your Catawba ConvertiCoop using engaging illustrations and directions. If you can put together a model kit, you can build a Catawba ConvertiCoop using simple powertools. My building illustrations are professionally rendered and illustrated. The most complex tool in the instruction booklet is a router, and you don't even really need that. You won't need an 18" rabbited rotary dado planer/sander/grinder whatever... no matter how much Norm Abrams or Bob Villa tries to convince you otherwise. I decided to take this task on while my husband was underway on his first submarine patrol. Crazy, maybe...but I like challenges. 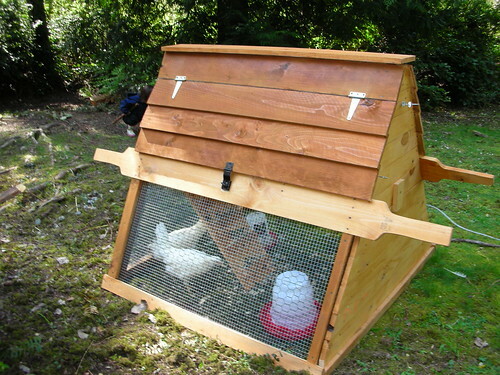 I liked the idea of being able to move the coops. 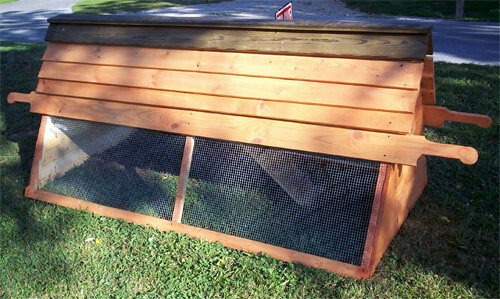 I set out (with the help of my 70 year old grandmother) on building my first chicken ark, let alone my first big wood project. It took just a few days and that's only because I have a 4 year old and a 2 year old running around. Imagine having these spunky little charismatic creatures in your backyard. Sometimes they look like little dinosaurs as they streak across the yard. And people love em. My house is right beside the city park and pool. Mothers and children come into our backyard all the time to see the garden, the rabbits, and especially the chickens. 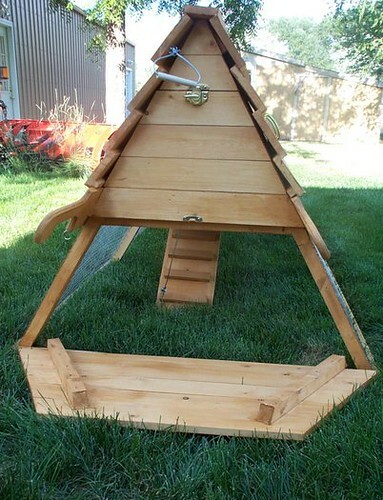 All the time I'm asked, "Where did you get your chicken coop? It's amazing." They're always surprised when I tell them I how easy it was to build it myself using regular tools and dimensional lumber from a home improvement warehouse. Mitzi and I get asked about our homestead so much that we've put together a 3 fold brochure that details what we're doing and how we did it. I've had over 20 people ask me to build a Catawba ConvertiCoop for them. 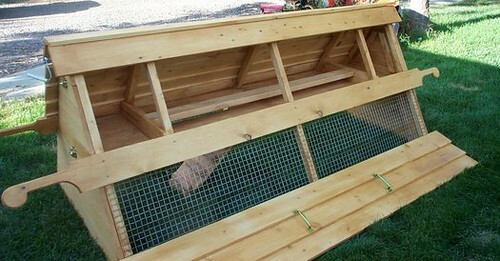 Even more want to know if they can come out with a tape measure and measure my chicken ark so they can build their own. Folks, these are not people I know. These are people on the street, walking past my house as I'm watering the tomato plants. If you buy my plans, you won't need to come to Wake Forest with a tape measure. It's all in the booklet for you. And to be honest, I have ulterior motives in selling these plans. As of September 1st I found myself among the ranks of the unempl... er, self employed. God has truly blessed our family in that we are debt free (Romans 13:8). This means that our family of five can get along on an amount of money that most people would consider significantly below the low-income level. Yes, it means giving up a few things, but it now allows me to be much more actively involved with my children's education and day-to-day operations of my family and household. That's kind of a cool thing that I missed out on when working a regular 9-5 position. I have never once in my life written a note to an author of a book, until now. And I am an avid reader. Earlier today I purchased your book and was so impressed by how quickly you answered my questions during the purchase process. 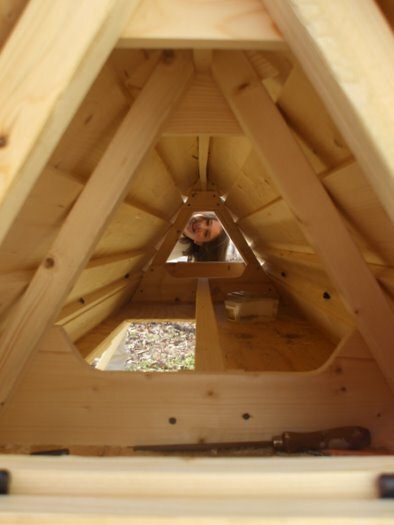 I've just read through the plans while regularly referring to the SketchUp file. Wow! It all works together so nicely. Like I said I just hope that the materials in France match up to your materials list. I actually wish it wasn't a holiday (Labour Day) here tomorrow just so I can go out and get the materials needed. I'm still a bit nervous about that miter saw and am hoping I can find a neighbor who can help me with some of the cutting. I was impressed by how your humor, politics and character came through in your writing. Thank you for your great ideas and for sharing! Sounds great to me! Where can I buy a set of plans? Just click here to purchase and start enjoying the "wild life" in your backyard. I got a call from my dad last night. "Bubba," he said. (He calls me Bubba when he's feeling chummy.) "Bubba, I read your 3 fold brochure that you wrote about your urban homestead. I have to tell you that I think it is well written and entertaining." "Well thanks dad. I try to write like I speak." I replied. by scrolling to the top or bottom of the screen! 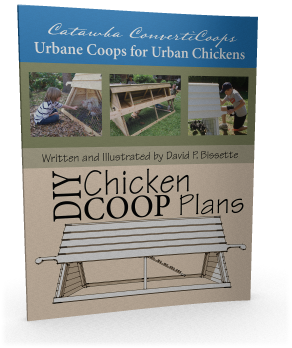 After purchasing a set of Catawba ConvertiCoop DIY Chicken Coop Plans, I'm going to throw in an additional piece of information FREE OF CHARGE. Knowledge is power. I'm going to GIVE you the 3D file that I used to create the illustrations in the book. Of course, without a program to view the file, it's worthless. That's why I'm going to include a link to the Google Sketchup 3D modeling software in your packet. 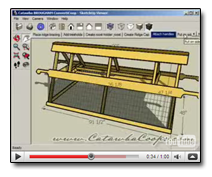 In Sketchup, you can review all the steps required to built a coop just by clicking on the tabs at the top of the screen. You can also fly around the Catawba ConvertiCoop and zoom in on parts that you really want to see... all in Real Time on your computer. Click the image to view the video preview of my completely interactive 3D tour. 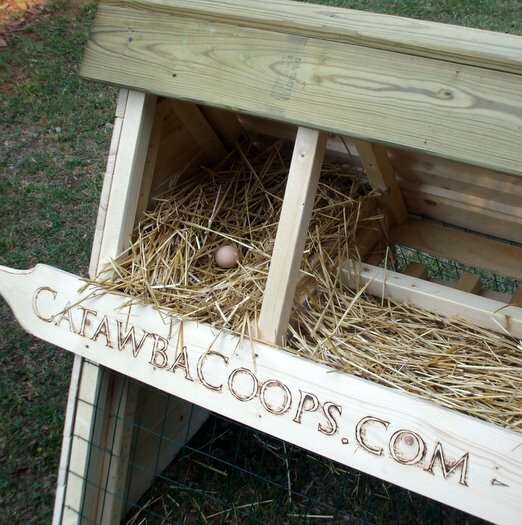 Just thought I’d drop a line to let you know how I made out with the Catawba Coop plans. Your plans are awesome! Your concise instructions and drawings left no doubt about how to put it all together. BONUS: I'm also going to include the marketing forms I used with my neighbors in MS Word Doc file format and the Petition I used with the town permitting office... That way you don't have to reinvent the wheel. You can just make changes to my documents as you see fit, print them off, and be well on your way to the fun of having chickens in your own back yard. You'll get a 100% Satisfaction Guarantee or your money back. E Wake County has a lack of nutritional food options. The Grain Mill Cooperative can cross that desert. View our membership campaign.